Rocky mountainous areas. In summer, usually at or above the tree line. Reported as high as 21,840 feet. Lower elevations in winter. Mostly crepuscular (active at dawn & dusk). 55 to 165 pounds. Five to seven feet head to tail. Tail about 45 percent of total. 16 to 18 years in captivity. Sheep, goats, marmots, wild fowl, hares, deer, domestic livestock and pets, and occasionally grasses. Long and dense fur on tail and body in the winter, thinner in the summer months. Grey back and sides patterned with rings and spots. White belly fur. Very inconspicuous on snow or rocky slopes. Paws furred on bottom between toes, giving them good traction on snow and protection from the cold. Offspring: One to four, usually three. Incubation: 90 to 103 days. Parental care: Female stays with young through its first winter. 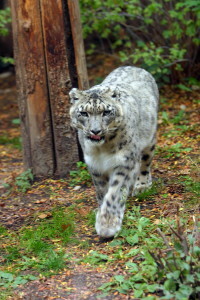 Snow leopards hunt in a crouching position and leap 20 to 50 feet to bring down their prey. Prey is sometimes three times the weight of the leopard. They are good climbers and rest in trees when feeding in the forests during winter months. Adaptations for mountain life include a well developed chest, short forelimbs with large paws for walking on snow, long hind limbs for leaping, and a long flexible tail for balancing. Adaptations for cold include enlarged nasal cavity, long fur with wooly undergrowth, and a thick & furry tail for wrapping around its body and face. 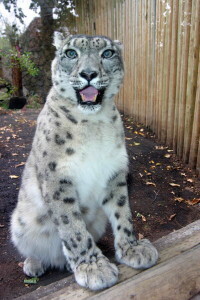 Snow leopards do not roar like most of the big cats, but they purr, hiss, yowl, and growl. They are solitary except when mating or with cubs. They are so secretive and rare in the wild that little is known of their natural behavior. They have been hunted for their fur and because they prey on domestic animals. 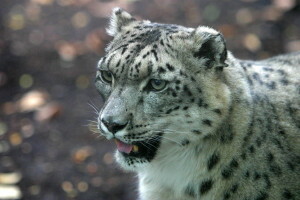 Snow leopards are now being managed in captivity on a Species Survival Program.